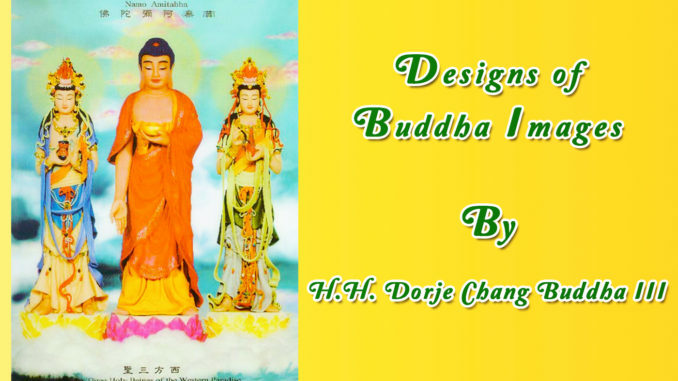 The images of Buddhas designed by H.H. Dorje Chang Buddha III Wan Ko Yeshe Norbu Holiest Tathagata are the most awe-inspiring and sublime images of Buddhas in the world today. Everyone who has seen images of Buddhas designed by H.H. Dorje Chang Buddha III feels that each one of them is a world treasure. One example is the twenty-one-foot-high statue of Amitabha Buddha inside the Hua Zang Si temple in San Francisco. That statue has been generally recognized as the most majestic Buddhist statue in the world. H.H. Dorje Chang Buddha III designed that Buddhist statue. The factory that produced it used as its blueprint an oil painting by His Holiness. H.H. Dorje Chang Buddha III personally decided upon revisions to that statue many times during the production process. His Holiness not only designed that statue, He also made the final decisions on all aspects of that statue, including the shades of colors used. “The Three Holy Beings of the Western Paradise,” which is the first three-dimensional thangka in the world, and a three dimensional image of the mandala of Green Tara were both designed by H.H. Dorje Chang Buddha III. His Holiness revised them several times during the production process. They are majestic mandalas containing images of Buddhas. Because H.H. Dorje Chang Buddha III is the true incarnation of the primordial Buddha, His Holiness thoroughly understands the thirty-two major auspicious marks and the eighty minor auspicious marks of a Buddha’s body. Thus, His Holiness is able to design the most majestic images of Buddhas in the world.